I have said it before and I will say it again – I love getting to Jamaica Bay at the end of a day and photographing waterfowl flying in and out of the West Pond. 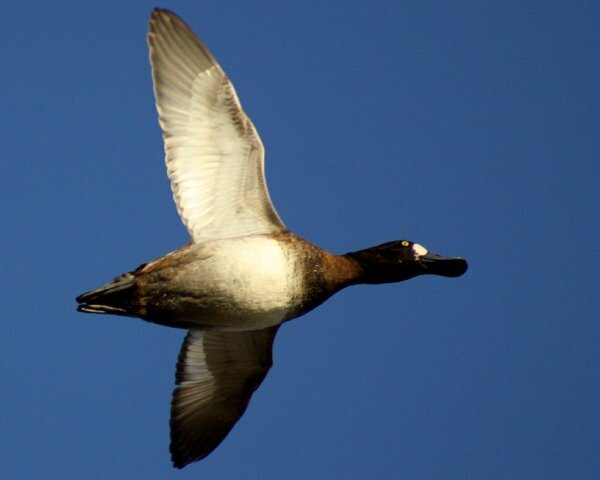 The bird that is flies in and out in the greatest numbers of late is Greater Scaup Aythya marila, sometimes known as Bluebills, for obvious reasons. All of these shots were taken last week when I had an evening to spare watching and photographing the ducks going over my head and out into the bay. Nice shots! One Lesser in the third picture from above, I reckon? @Jochen: I don’t see it – what bird are you referring to? 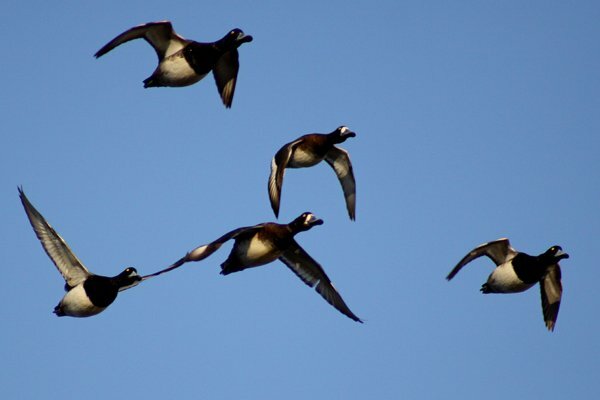 @Corey: I believe the bird Jochen is referring to would be the male scaup, 3rd in from the top left in the 3rd photo from the top. 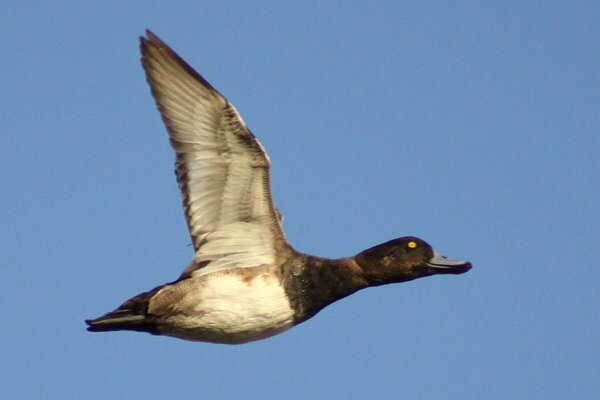 The bird is smaller in size than the Greater Scaup. More supportive is that the white shading doesn’t extend to the wing tips, rather it seems to halt about mid-wing where it seems to blend to gray/brown. 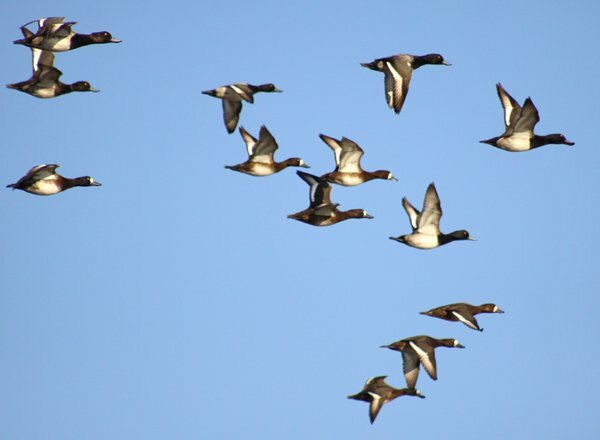 I believe this is the best separation clue used by sea-watch counters for scaup in flight. @Derek: I wonder. If that is the bird that Jochen is referring to I am not sure. The smaller size can be explained by the fact that it is further away (which you can tell because it is out of focus compared to the other birds). And if it is the color in the wings then the bird a bit further to the right looks good too. 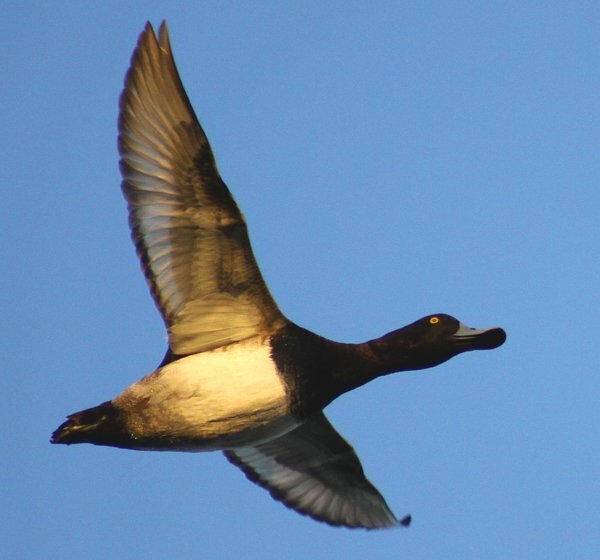 That said, I am by no means an expert, or even very knowledgeable, about field marks of scaup in flight. Sorry, been off-line until just now: 4th bird from the left, male right above a female. Wing-pattern seems to fit with sharp border between primaries and secondaries. Also different head profile and “feel”. @Corey: I would agree with Jochen. The bird is still smaller in size than the other similarly “out of focus” scaup in the lower right hand corner. At first I agreed with Jochen about head profile, but that could be attributed to artifact either from camera angle or head tilt. Nevertheless, wing pattern seems fairly definitive. Though ideally we would see it in full downstroke to be sure. Even wing shape looks different, this bird has relatively rounded wingtips in comparison to the Greater’s. I don’t recall if that is an actual point of differentiation for field ID though. 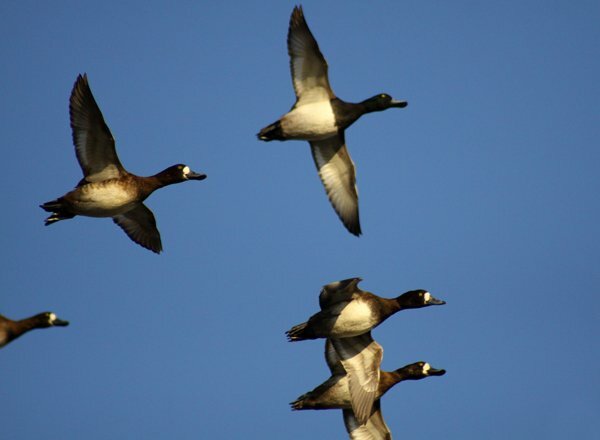 The wing pattern, i.e. extent of white, is one though. 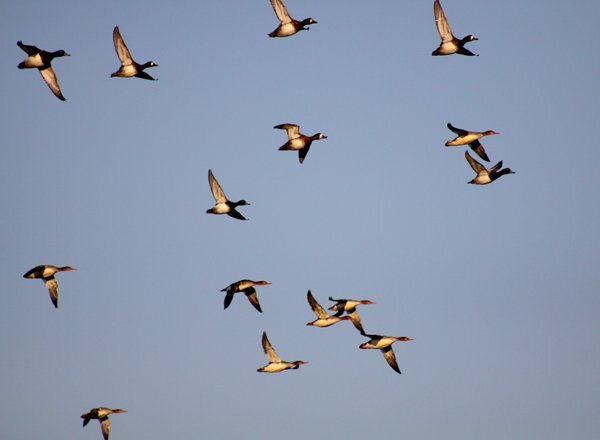 No other bird in the photo shares that pattern of Lesser. 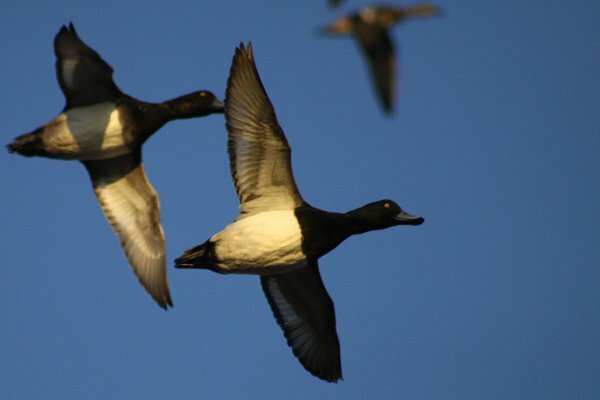 Awesome flight shots and beautiful shots of the Scaup. Happy Birding and have a great weekend! Arbor Day = Ecological Devastation?